In Courtroom 1 from Monday 21 until Wednesday 23 October 2013 are the linked appeals of P (by his litigation friend the Official Solicitor) v Cheshire West and Chester Council, and P & Anor (by their litigation friend, the Official Solicitor) v Surrey County Council. Both matters concern appellants who lack the mental capacity to make decisions about their care. 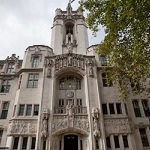 In P, there is no dispute as to whether the appellant’s care plan is in his best interests; the dispute is whether it imposes such restrictions on the appellant as to deprive him of his liberty contrary to ECHR, art 5. In P and Q the Court will clarify how to determine whether there is a deprivation of liberty for the purposes of the Mental Capacity Act 2005. On Wednesday 23 October the Supreme Court will hand down judgment in the following: R v Gul, Szepietowski (Nee Seery) v The Serious Organised Crime Agency, In the matter of “The Alexandros T” (Nos. 1, 2 and 3), and Woodland v Essex County Council. On Tuesday 22 October in the Privy Council is the appeal of Moss v The Queen, a case from the Bahamas. There are no further case details available for this matter. Leave a reply on "In the Supreme Court w/c 21 October 2013"